(3)Direction For Use :- 1 o 1.5 g. Buty in morning empty stomach with 100 ml lukewarm water ( Dose depends upon age, weight & illness of the individuals) OR as directed by physician. (4)Benefits :- Ramban Buty increases digestive power & regulates peristaltic activity of git therefore useful in indigestion, gas trouble, constipation, sprue (sticky motion), worms etc. It digest ama(toxic products) therefore useful in rheumatoid arthritis, seronegative arthropathy, psoriatic arthropathy, ankylosing spondylitis, arthralgia seen in viral fever eg. Chikungunya. 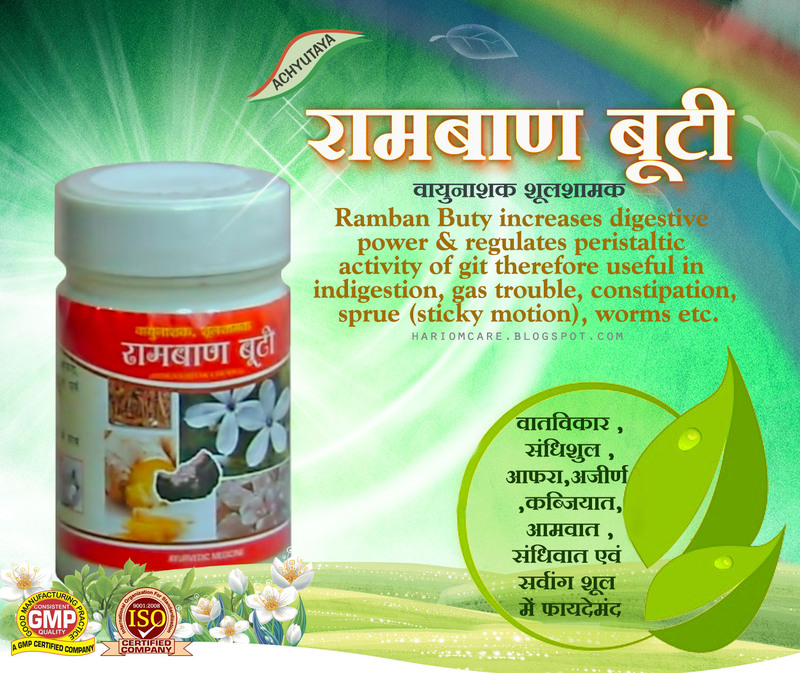 (5)Main Ingredients :- Ferula Narthex(hing), Plumbago zeylanica(chitrak), Zinziber officinale(sunthi) etc.